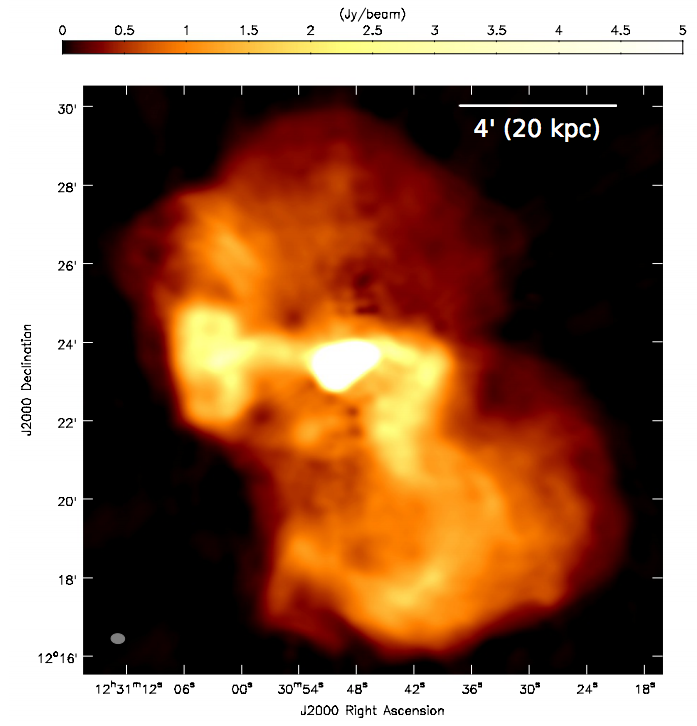 A paper appears on the arxiv today with new images of the centre of nearby elliptical galaxy M87, taken with the Dutch LOFAR stations. M87 at Metre Wavelenghts: the LOFAR Picture, by de Gasperin et al. (A&A in press). M87 (also known at Virgo-A) is one of the two massive elliptical galaxies found at the centre of our nearest cluster of galaxies (the Virgo cluster). In the centre of M87 is a well know actively accreting supermassive black hole, which is emitting jets of energetic particles which emit significant amounts of radio. These jets are even (just) visible in optical images of M87 (the blue line below). Optical image of M87 taken with Hubble Space Telescope. Scale 3x3 arcmins. More details. M87 has often been a poster child for radio astronomy images. 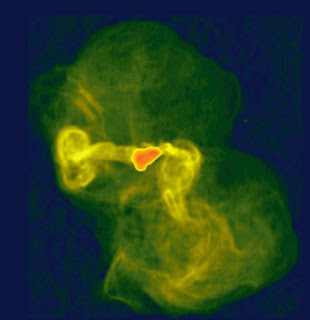 These images of the jet taken by the NRAO's VLA can be seen in many talks about radio galaxies and AGN. M87 imaged at 90cm (300 Mhz) with the VLA. Scale 15x15 arcmin. More details. And especially this series of images zooming into the central regions. For more details see the APOD entry for this image. 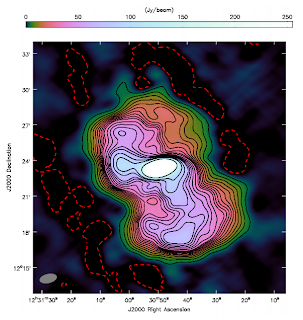 The paper on the arxiv today used observations of M87 with both the HBA and LBA arrays of LOFAR. The Dutch stations only were used in this observation - adding in international stations like Chilbolton will be able to increase the resolution even further, and I will look forward to seeing that in the future. I have extracted two of the images from the paper. This first was taken with the HBA at 140 MHz (2.1 m) and shows an area 15x15 arcmin in size (same as the VLA image above, but at wavelengths more than twice as large). And this shows one of the many LBA images made - this one at 25 Mhz (12m) of a slightly larger sky area (21x21 arcmin). These new observations at lower frequencies than ever before allow scientists to better constrain the spectral shape of the radio emission from the jets, which in turn can be used to constrain the details of how the supermassive black hole in the centre of M87 is able to power these extremely extended emission regions.